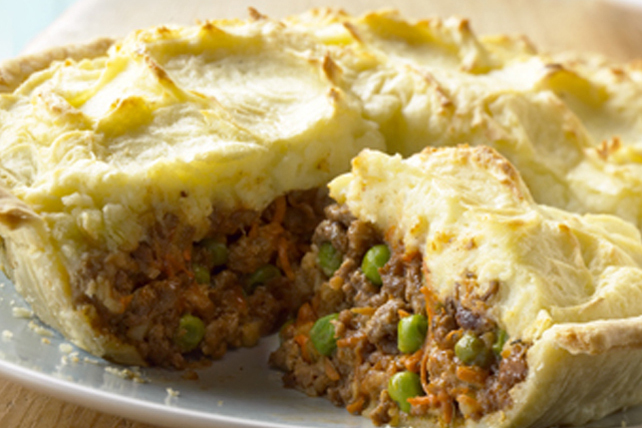 Your family is sure to enjoy this delicious recipe featuring the best of two classic dishes - a French Canadian tourtière and shepherd's pie. Cook potatoes in large saucepan of boiling water 20 to 25 min. or until tender. Meanwhile, brown meat with onions in large nonstick skillet on medium heat; drain. Return meat mixture to skillet. Stir in flour. Add chili sauce, beef broth, Worcestershire sauce, bay leaf and dry seasonings; mix well. Bring to boil; simmer on medium-low heat 10 min. or until slightly thickened, stirring occasionally. Remove from heat. Remove and discard bay leaf. Add carrots and peas; mix well. Heat oven to 375ºF. Drain potatoes; return to pan. Add butter; mash until potatoes are smooth, gradually adding cream. Spoon meat mixture into pie crust; top with potatoes. Bake 45 min. or until heated through. Prepare using 1/2 lb. (225 g) each ground beef, pork and veal.